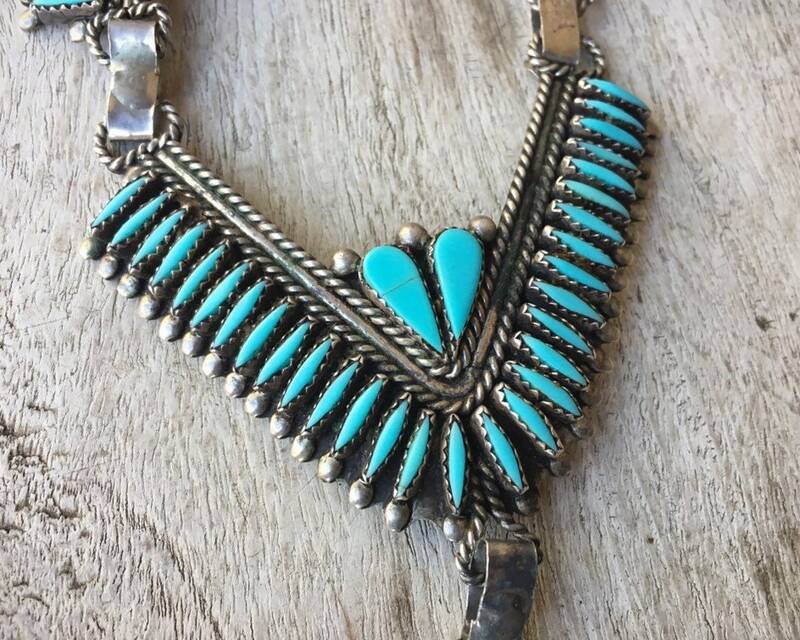 This absolutely STUNNING 1950s to 1960s necklace features Sleeping Beauty turquoise in needlepoint setting and comes from an old Taos, New Mexico estate. The piece consists of three sections, all interconnected with a handmade link chain. The chain continues up each side, and the length quite long, meant to wear as a necklace. 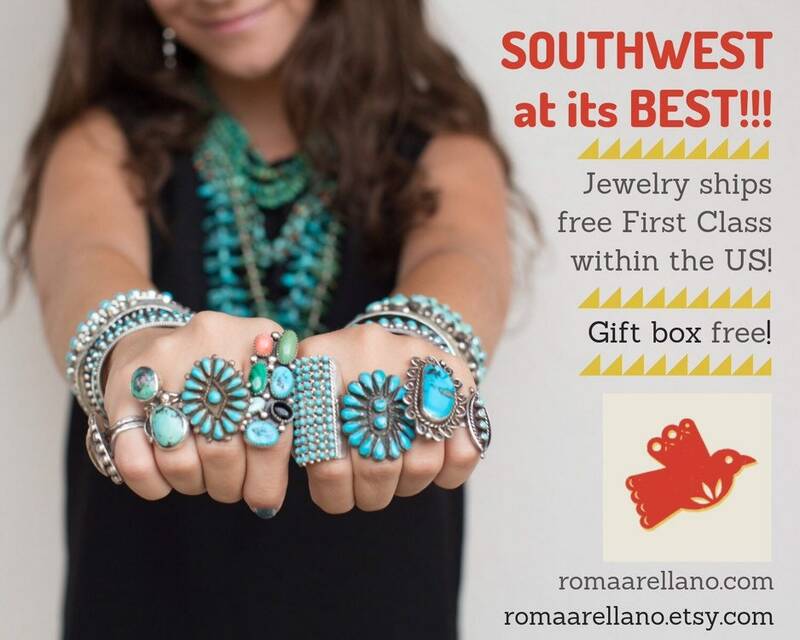 These pieces are ceremonial in style, worn by the women of the Zuni Pueblo. 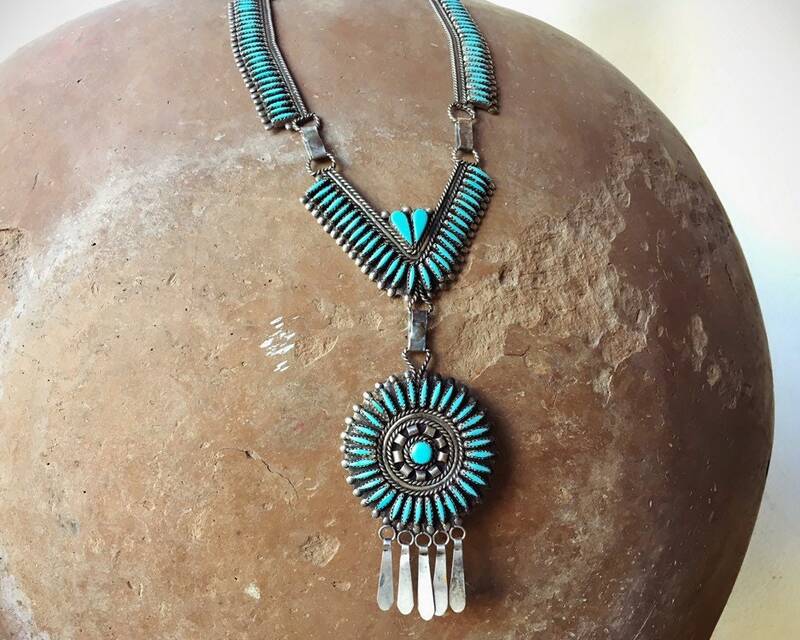 They are an alternative to the larger squashblossom, although they are just are striking and often contact is perfectly set for the necklace to hang right on the upper chest--not quite a choker yet high enough to be the focus of the eye when worn with a lower cut neckline. 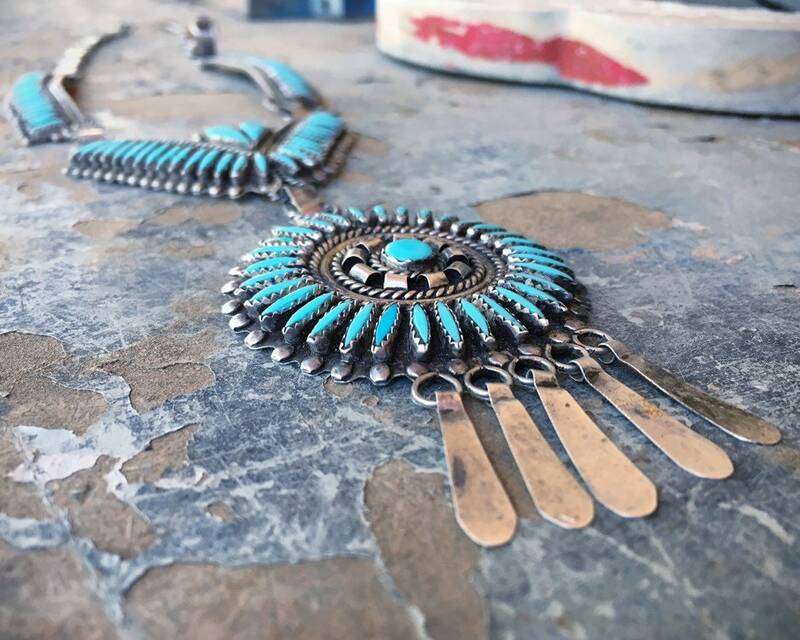 About 75 cabochons of turquoise are hand shaped to fit into sawtooth bezels in a tedious and exacting process, which is well worth the results. 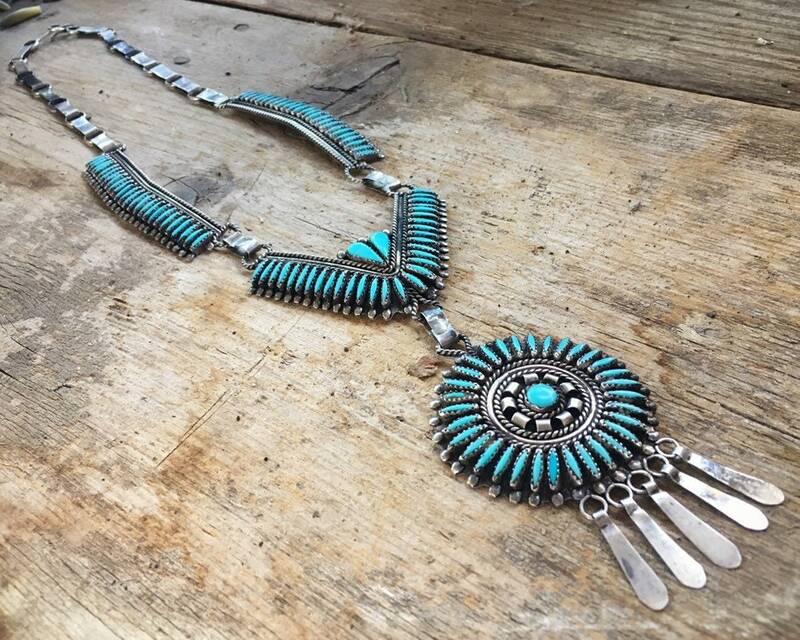 The necklace has a lavalier style that lays beautifully against the neck and chest. The chain is all handmade. Everything about this piece is beyond special. 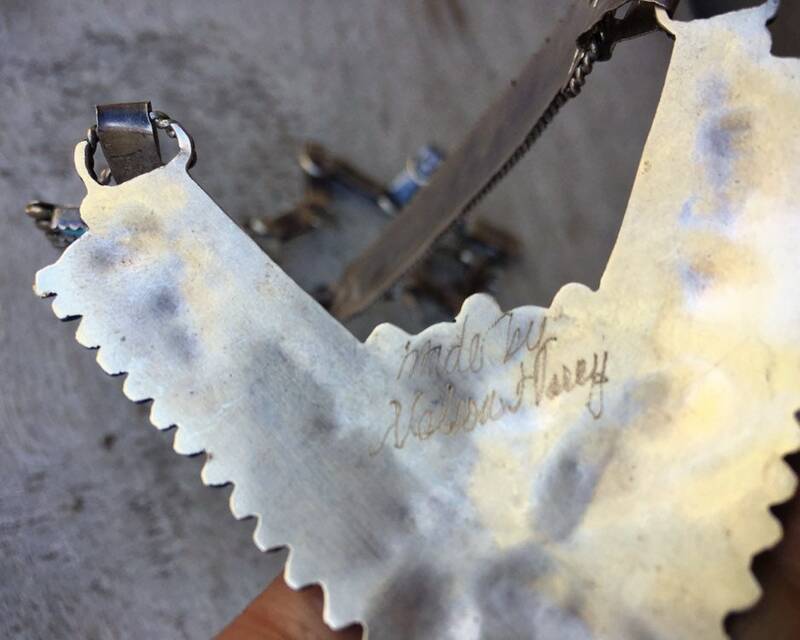 It carries a hallmark carved into the back with a dremel tool, Made by Nelson Harry. I am not 100% certain of that last name, as it is obscured in part by the "y" of the "By" above it. 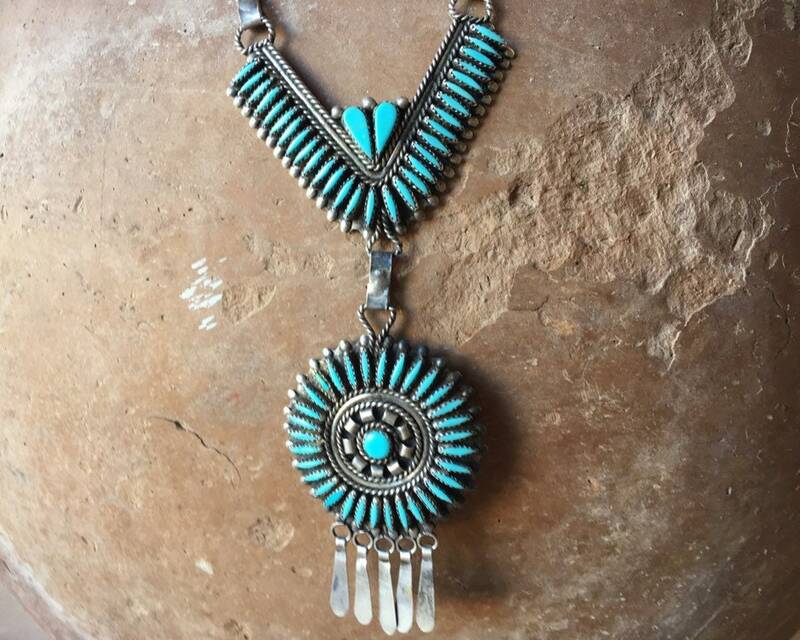 I have found Zuni jewelry by an artist of the name Nelson Harry, although that hallmark is with a stamp, so this could have been an early piece by the same artist or perhaps a father or grandfather. 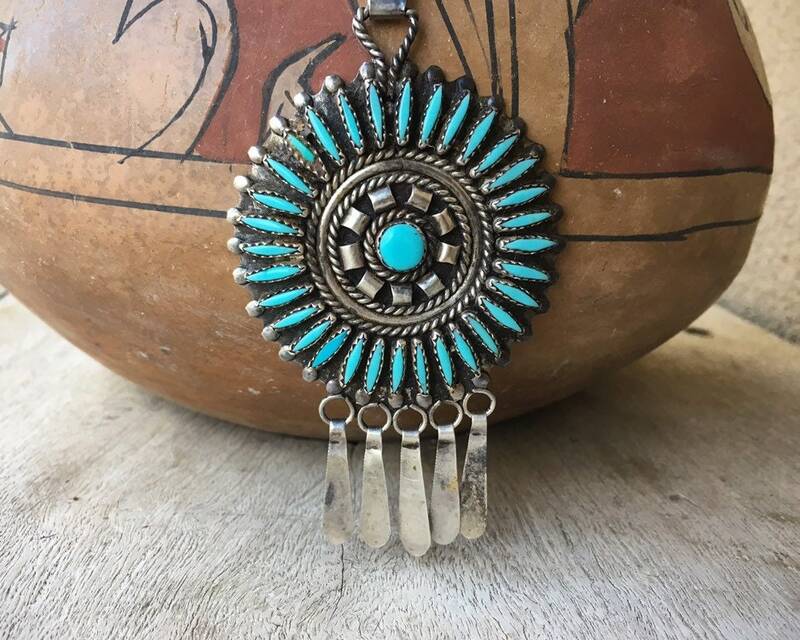 The necklace measures about 13" on each side including the clasp (or 26" combined), and with the pendant included it hangs to closer to 16", possibly slightly less accounting for the curve of the neck. The center pendant is 2" wide by 3" long. The V-shaped section above the pendant is 2-3/4" wide by about 2" long. The sections up each side are about 5/8" wide by 3-1/4" long. One turquoise cab, larger and teardrop shaped in the V-shaped section, has a surface crack (see Photo 8) yet is well-seated. One of the turquoise slivers in the round cluster is broken (see Photo 9) yet also well seated. One of those slivers was replaced and is darker blue. The handmade chain has some dents and dings but is intact and can be worn at a shorter length than the full 26". Small scratches on the back from age and wear. 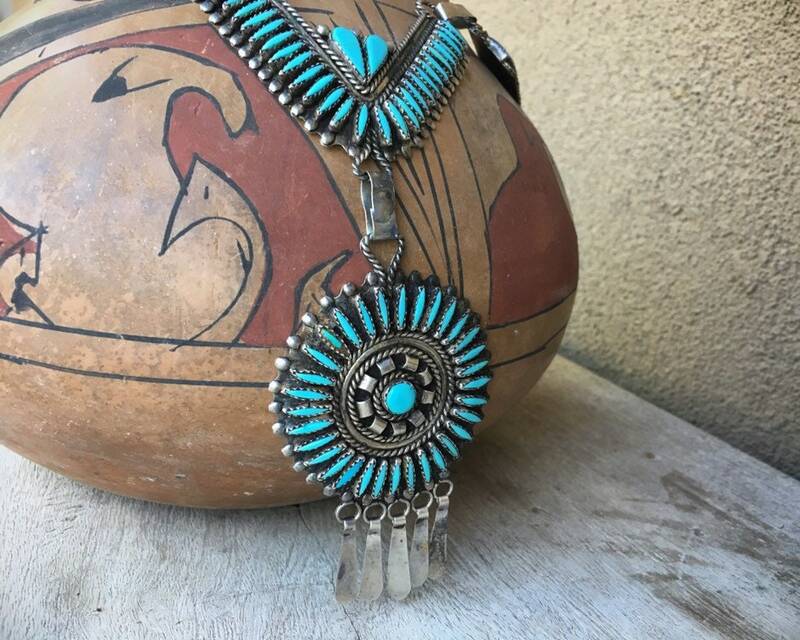 An amazing one-of-a-kind vintage treasure!